Erma’s Frozen Custard is the place to be if you want some top quality frozen custard and some exciting, fun ways to top it. This place has so many wonderful flavor concoctions it is somewhat overwhelming to decide on just one! Give me two. NO! Give me three! The flavor options here are just mindblowing. This was my first time visiting with my little family of 3 and we each chose our own parfaits. I just had to go with Peanut Butter & Jelly. I really have a thing for PB&J and that is my jam right now. My husband went with the S’mores Parfait. I believe I heard him moaning over just how good it was. And last but not least my daughter, Chloe, went with a Candy Parfait. Keep reading my Erma’s Frozen Custard review to learn more about this delectable little ice-cream shop! Hard work does pay off… in frozen treat form! We had a yard sale for the past few days and this was a great place to go to reward ourselves for our hard work. Chloe had a blast with the yard-sale (it was her first) and she was so thrilled about earning some money. It was her idea to go out for ice-cream. She insisted that she wanted to purchase her own sundae with her own money. That kid had some sheer determination to spend money last night! It was my idea, of course, to try out something new. Erma’s Frozen Custard is so conveniently located that we could actually take a stroll and walk on over there. How have I been living in St Clair Shores for so long and never ever stopped at Erma’s. It saddens me to think about how much I have been missing out on all these years. I am definitely going to visit this place one more time before they close for the season. I already know what I’m going with too~ Raspberry Truffle Parfait! I want to discuss a bit on my parfait that I ordered, the Peanut Butter & Jelly! Let’s start with the bottom here: first up is vanilla custard, a layer of peanut butter, chopped peanuts, more vanilla custard, a generous helping of strawberry jelly, more nuts, whipped cream and then topped off with a cherry. I gotta say that I enjoyed this immensely! Yes I said that word and I reserve it for rare occasions! In the two photos below you can see just how many options Erma’s Frozen Custard offers. I highly suggest checking out Erma’s frozen custard menuÂ so you aren’t standing around looking dumbfounded trying to figure out what the heck you are going to order! What I love about this place is that they have some great flavors of dip that you can go with! I love that hard-shelled dip on my cone. They even offer a Confetti Cake dip! I am addicted to any and all things cake flavored and I know I will be going with that dip someday. I absolutely love their creativity here and there is something for everyone. Numerous options to choose from here! Erma’s Frozen Custard offers sundaes where you can choose one topping. These sundaes also come equipped with whipped cream and a cherry on top because no sundae is complete without that. Then they offer something called an Explosion! With the Explosion, this is where you can really let your creativity shine and you get your choice of not one, but two different toppings. You can see the Erma’s Frozen Custard menu in the photos below. So many flavors to choose from at Erma’s Frozen Custard! Featured flavors of frozen custard week by week. More than just parfaits and sundaes! If you are craving something besides a parfait or sundae you are in luck because Erma’s offers a variety of other things you can go with. They offer milkshakes, slushies, floats & coolers. They offer specialty desserts as well such as: Custard Puff, Brownie Delight, Strawberry Shortcake, Banana Split, and a peculiar item known as an Upside-Down Banana Split (that is something I most definitely need to try!). Erma’s Frozen Custard offers 100% Michigan dairy products and their frozen custard is gluten and soy-free. You can read up on this more HERE. These parfaits come in at $6.30 a piece. For a family of 3 to go out for parfaits here you are going to have to fork over $18.90. I am not what I would consider a stingy person whatsoever but for the amount of ice-cream and toppings that they give you for $6.30 just is not enough for me. I truly feel that maybe these should cost a little less or possibly just make the serving size larger. I will visit this place again when I have the means to, but I really believe that the price is a tad too steep. We usually do not pay that much to go out for ice-cream. We can go to Menchie’s and do big build-your-own froyos with a ton of toppings and usually only be out $15 for the visit there. Where can I get my Erma’s? Great news Michiganders! There are multiple locations to find Erma’s Frozen Custard. There are currently locations in: St. Clair Shores, Shelby Township, and Warren, MI. Check out the store locator for more details on where you can find your closest Erma’s! 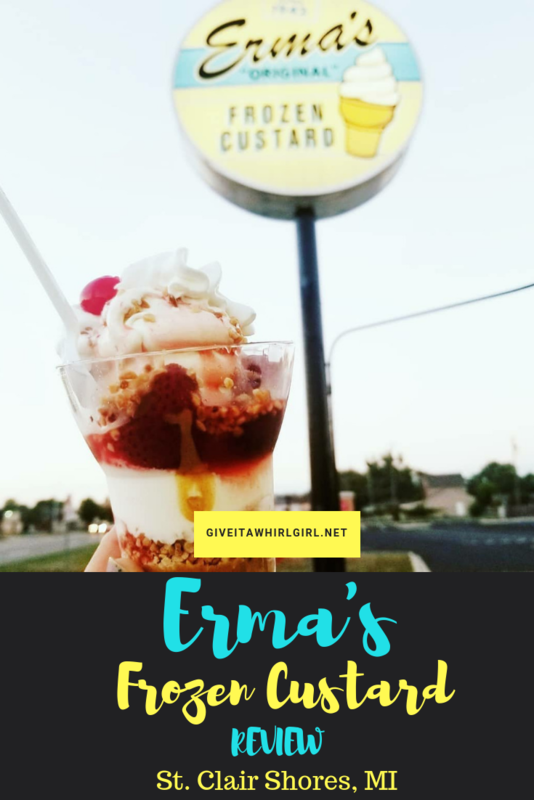 I hope you enjoyed this Erma’s Frozen Custard review and it inspires you to visit! I believe you will fall in love with this place at first bite! So what will you be ordering at Erma’s Frozen Custard? Check out their menu online and leave me a comment and let me know what appeals the most to you! Please note this is a seasonal establishment! They are open April 1- October 31. This entry was posted in Local Spots I Visited and tagged candy, candy sprinkles, cheat day, cherry, chocolate, dessert, Erma's Frozen Custard, frozen custard, frozen treat, gluten free, glutenfree, marshmallow, michigan, peanut butter, peanut butter and jelly, restaurant review, review, smores, St Clair Shores, strawberry, whipped cream. Bookmark the permalink.